The pier, which is the local hotspot for big-name catches and seasonal tasty trophies to take home and enjoy over a grill, has a long legacy of attracting neighboring Myrtle Beach visitors to this smaller, and less developed region, and is the home base for hours of vacation fun which includes great fishing, good eats, and incredible Atlantic views. A fantastic spot for inspiring photos and memorable strolls, and an even better locale to reel in the big one, the Surfside Fishing Pier is a town icon that brings vacationers bank to Surfside Beach after year. The Surfside Pier, originally envisioned and built by local developers, has a not-so-surprising stormy history that dates back to its original construction in 1953. After a wave of hurricanes and storms throughout the decades, including Hurricane Hazel in 1954 and Hurricane Hugo in 1989, the pier was rebuilt a whopping three times until the current structure was erected, and leased by the town of Surfside Beach as a local attraction. Originally a star of the beach scene with a neighboring arcade and amusement pavilion, and an on-site restaurant to cater to hungry fishermen, today the pier and its bordering attractions are no less remarkable, and welcome thousands of vacationers every year who are on the hunt for the perfect catch, the perfect view, or just the perfect beachside ice cream cone. 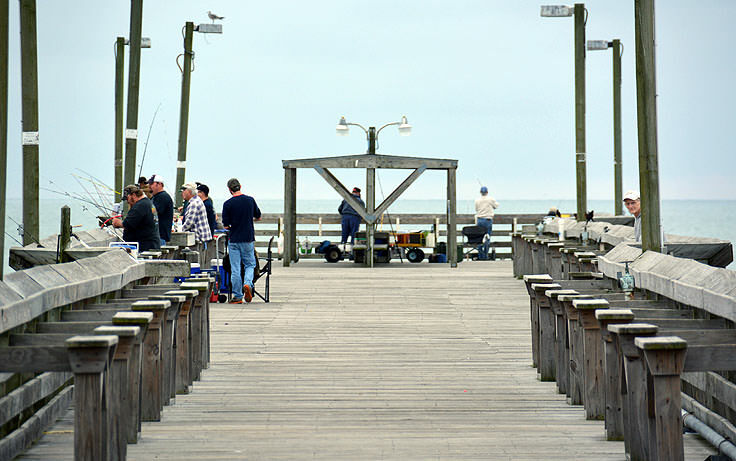 The fishing pier is well known among Grand Strand fishing circles as the place to go to reel in the mightiest and most impressive catches. In the past couple years alone, local and visiting anglers have caught a 98 lb. tarpon, a 19 lb. Spanish mackerel, a 10 lb. bluefish, and a 4 lb. flounder, all from the comfort of the spacious wooden pier planks. The pier even keeps a record of their best seasonal catches, which is posted online, so visiting anglers can see at a glance their local competition for biggest catches. The pier itself is an 830' foot long wooden structure, with plenty of benches and fish cleaning tables placed along the wood railing, and a covered platform at the end of the structure, giving all-day anglers a bit of much needed shade. The view from the pier's edges and end is simply unparalleled, overlooking the high rise resorts and hotels of Surfside Beach, and extending all the way to the borders of Myrtle Beach, Murrells Inlet and beyond, making this local destination a favorite attraction for amateur photographers and dedicated sightseers. The cost to walk the pier is minimal, and generally runs around $1.00 per person for visitors over 7. (Kids who are 7 or under are free.) 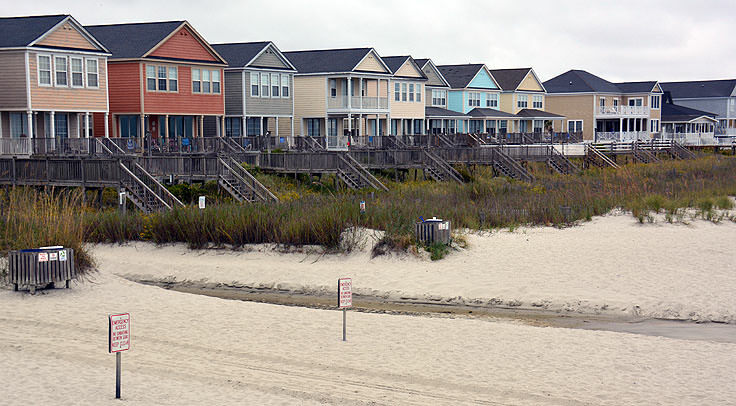 An all-day walking pier pass allows patrons to stroll at their leisure, and local homeowners with proof of ownership are welcome to take an easy walk along the pier at any time, free of charge. As for fishing, anglers can purchase passes to the pier on a daily, weekly, or annual basis with rates ranging from $9-$13 per person for a day, to $40-65 per person for a week, to $150 - $200 per person for a year, depending on if the angler is bottom or float fishing. (Float fishing rates tend to be higher.) Again, local residents enjoy discounts on fishing passes as well, although proof of local homeownership is required before purchase. The pier is open seasonally, closing for occasional winter maintenance, and is lighted so early morning and late-night anglers have plenty of illumination to cut bait, prepare their rigs, and cast out during some of the best, and most unpopulated, prime times for fishing. Anglers who are new to the pier fishing game can also stop by the pier house's tackle shop for in-depth information on what's in season, and a wide selection of rods, reels and bait to get their angling off to a great start. The staff is happy to answer questions on equipment and bait, and advance planners can brush up on their pier fishing education well before their vacation by visiting the Surfside Pier's ample supply of fishing tips online at the above link. The pier also offers an extensive gift shop, which is a favorite destination for many longtime Surfside Beach fans for keepsakes and souvenirs. With a collection of distinctive Surfside items that include jewelry, ornaments, Tees and apparel, thimbles, beach toys, and even salt and pepper shakers, collectors of all genres will find a little treasure or two at the gift shop to take home. 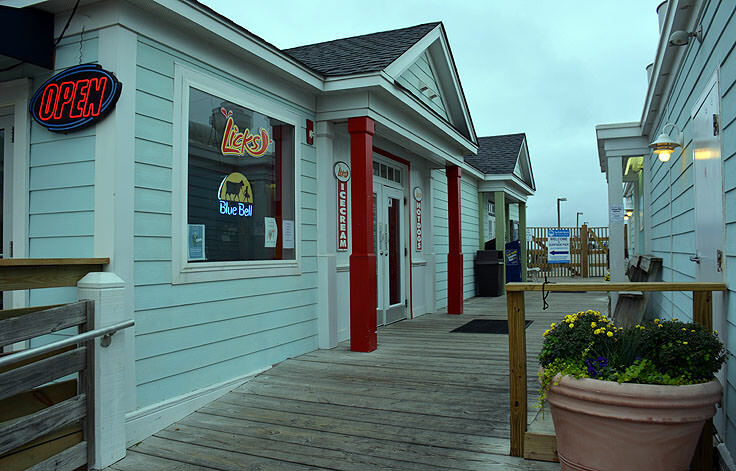 The gift shop also sells soft drinks, beer, and wine to enjoy an evening pier sunset with a cold happy hour beverage of choice. There's also a very popular ice cream station where anglers and families alike can indulge in an ice cold treat to enjoy mid-stroll on a hot summer day. 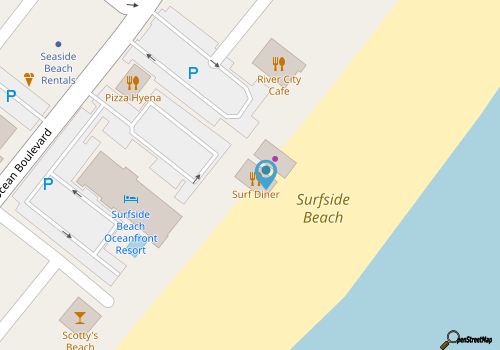 Adjacent to the pier, hungry vacationers can hit the Surf Diner restaurant, an extension of the Surfside Pier's structure which offers incredible views of the pier itself as well as the Atlantic Ocean waves. With an wide patio that hovers over the beach, and outdoor shaded seating in addition to a full bar, breakfast, lunch, and dinner, this local hotspot is known for both its wide variety of beachside fare in addition to its refreshing sea breezes and clear blue views. Moderately priced with a wide selection of coastal favorites, visitors will find this local venue a perfect spot to lean back, enjoy a god meal, and check out the pier action from a perfectly comfortable, albeit short distance away. The Surfside Pier helped build Surfside Beach into the popular family destination it is today, and it certainly shows no signs of losing its luster. 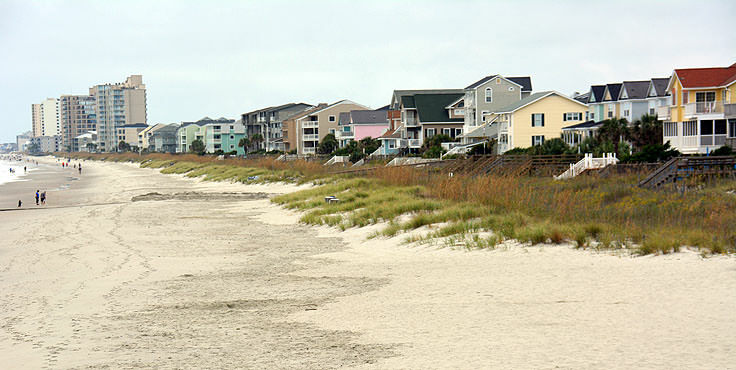 The preferred venue for beachside meals, refreshing oceanside strolls, and great angling, the Surfside Pier is a great example of why this southern Grand Strand community has a long history of being one of South Carolina's most entertaining, attractive, and all-around accommodating seashore destinations.